Not only can crows use one stick to retrieve some food, but they can use a short stick to retrieve a longer stick to retrieve some food. 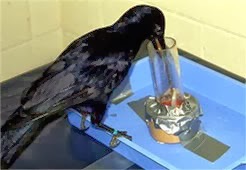 Not only that, but to make it even harder, researchers recently trained crows to have negative reactions to sticks by continually putting them in situations where the stick is almost but not quite long enough to retrieve food. They did this enough that the crows eventually began ignoring the sticks completely. AMAZING!! Go here for a more detailed explanation of the experiment. I was talking with my labmate Mikael about this, and he pointed out that we might want to watch out, birds might get better at using tools and take over the earth. Imagine that, dinosaurs almost completely die out, evolve into birds, and take over the world...again. Watch out!! We are so lucky they don't have thumbs! In that first picture the crow is smoking out of a bong right?